The image above may be looking all cooked up to you (It definitely is), but the news seems to be a real deal. Yes, our source tells us that Google is building a Chrome OS tablet. It’s real, and it’s being built by HTC. No surprise there, since HTC churned out the Nexus One for Google. The Chrome OS Tablet will be offered on Verizon’s network. The two majors (Google and Verizon) also had recently synchronized on the Net Neutrality proposal, so the partnership should not take you with surprise. The launch date that has been rumored until now is November 26th, 2010, which also is the Black Friday in US. This is a very calculative and brilliant launch date for the Chrome OS Tablet, as Black Friday is the busiest shopping day in US. So, it all again boils down to just one question: What is Google planning with its Tablet and upto what extent? Despite all its criticism initially, Apple iPad is still a big success and the sole leader in its category in consumer electronics. We think Google cannot do much wonders in design aspect of the Tablet, but it can gain an upper hand via a higher configuration in the Tablet and its pricing. 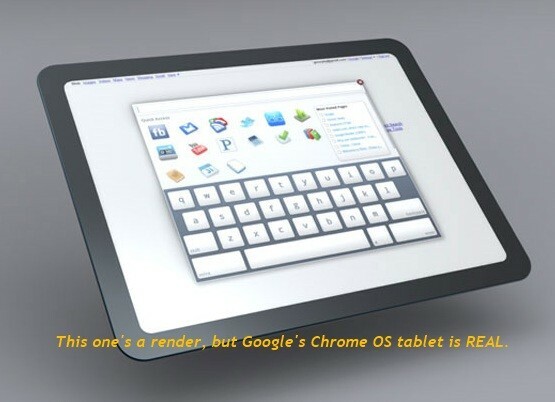 The Chrome OS Tablet is likely to be based on NVidia’s Tegra 2 platform. It will sport 1280×720 multi-touch display. It will be having 2 GB RAM and 32 GB SSD storage, with the option to expand via multi-card reader. All the connectivity options like Wi-fi/Bluetooth/3G and others like GPS and webcam are also obvious factors. As came the Nexus One, Chrome OS Tablet should also be highly subsidized and be cheaper than iPad. Chrome OS tablet? then it will named as Gablet? or ciblet? I like Google’s Chrome browser, but I really hope Google and Adriod would do some innovation and can bring surprise for users, not follow behind like iPad, iPad now is really a big win, it have many market share, and the iOS have been around with the iPhone, ipad, it’s yet fantastic and remarkable, and so many app developers are living on iOS like iFunia, a MAC media converter developer, Apple always can provides for a large number of infestor. does Google Chrome operating system work with Adobe Reader for pdf format file??? And I used Chrome operating system old version with Adobe flash player ,but I could not run facebook website game normally. Do I need a upgraded version of adobe flash player for facebook game normally with google chrome operating system??? htc done a tremendous job. thanks.